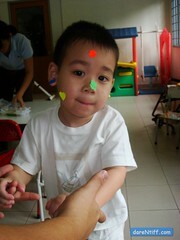 What are those cute funny dots on Nathanael’s face? Is Nathanael trying to dress up as a Clown? Is it a punishment for being late to School? Is that an overgrown pimple? Did Nathanael roll over a stickers book, and some peeled off and stuck on him? Is that the latest fad to Brighten Up Your World? Nathanael just completed a Mother’s Day Card for mommie. And Mommie decided to put an extra sticker on his face for fun. Guess what? It caught on, and the other teachers also put one on Nathanael. 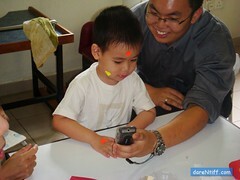 Nathanael playing with koko Ben’s phone. Nathanael really loves phones, especially Sony Ericsson phones. 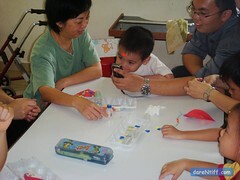 Nathanael with Teacher Dolly on the left and koko Ben on the right. This is Arts & Craft time. So lots of handiwork activity on the table. 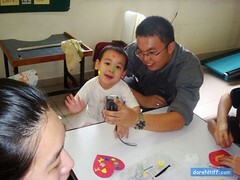 And now we would like to share this Video of Nathanael with you. This was taken at Bridges EIP, as he uses his hands to pick things up, play with them, and throw it back down. We have seen so much improvement in Nathanael’s ability in grasping and holding. We just Thank God for the great improvements that we see each week.